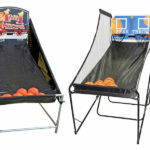 1 on 1 Hoops Electronics Basketball Game is the recent addition to our already large inventory of basketball games. 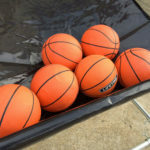 Together with Super Shot Basketball, NBA Hoops, NBA Hoop Troop and Double Shot, Video Amusement has selection of basketball games unsurpassed by any other rental company. 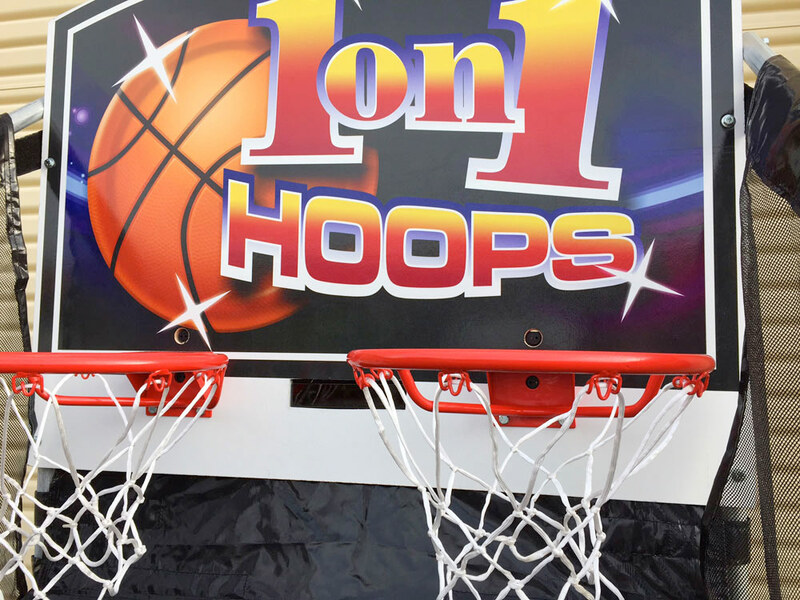 One on One Hoops Basketball Game for rent is a classic basketball game where two players compete in a shootout. One on one, to score the most point before they run of time. 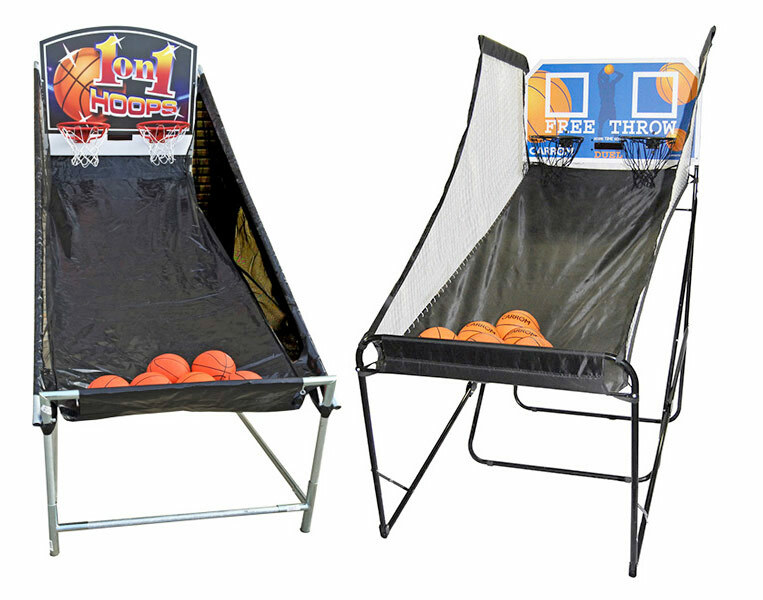 Rented 1 on 1 Hoops Electronics Basketball Game is fun for all ages. 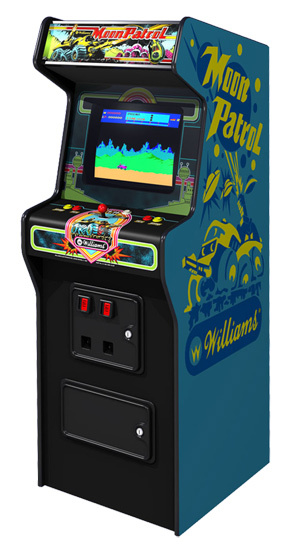 It is a fast-passed competitive game with a timer and LED electronic display. 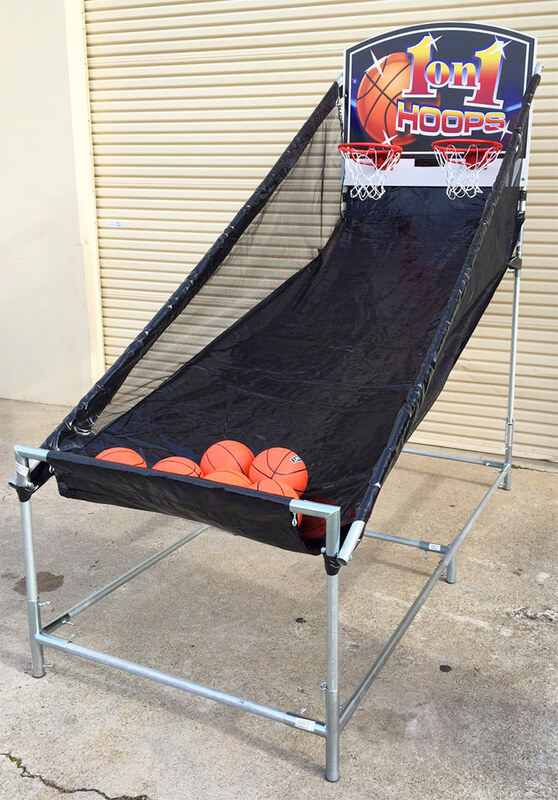 This is a great game rental for tournament play during March Madness season. 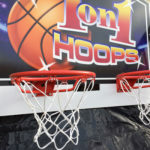 One on One Hoops Basketball Game is designed for two players. Featuring heavy-duty construction and sturdy netting. Build for some serious play and electronics sensor for accurate scoring. 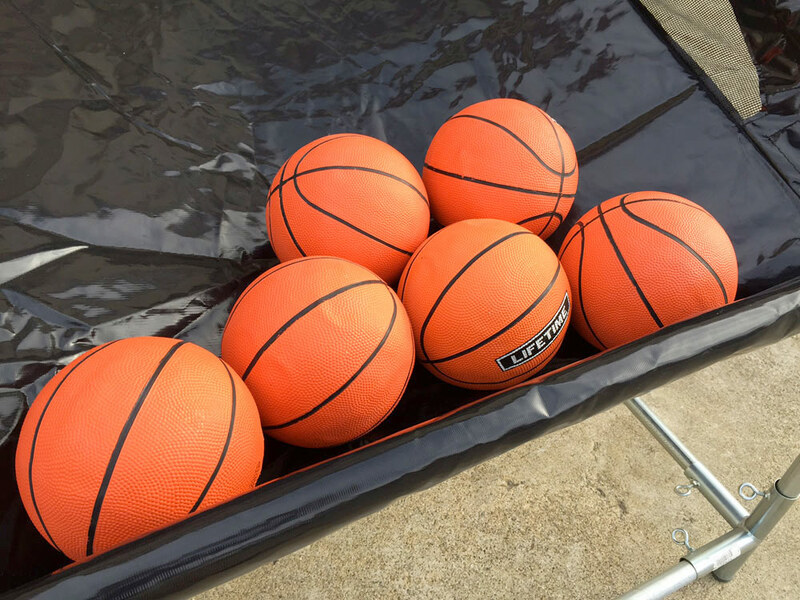 As the players fire the shots at the hoops, the side netting keeps the basketball in play for continuous shooting. 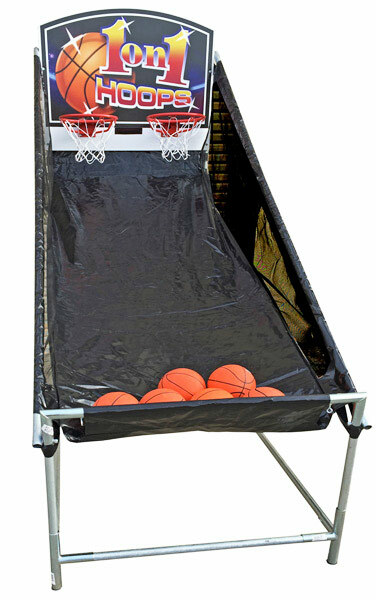 Rented 1 on 1 Hoops Basketball Game is a portable unit. 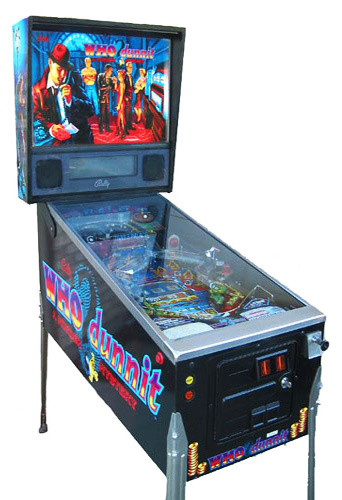 It will fit in most venues indoor or outdoor. 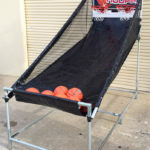 This is great rental game for any sport-theme party. March Madness, carnival, birthday, church event, school graduations, bar mitzvah or any other fun festivity. 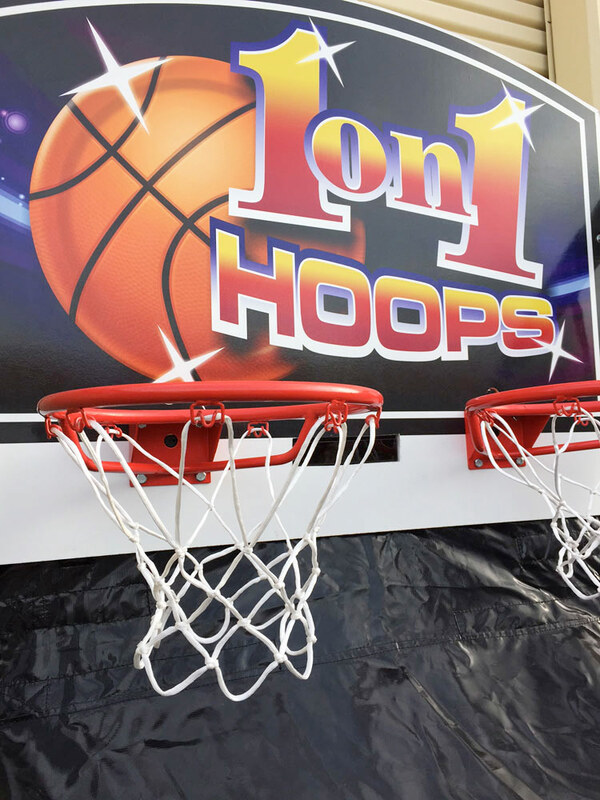 Video Amusement can also customize rented 1 on 1 Hoops Electronics Basketball Games with your company logo or custom graphics. The branding will make your company stand out at any event. Including trade show or your local tournament during March Madness season. 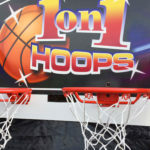 We deliver our rented 1 on 1 Hoops Electronics Basketball arcade game rentals in California San Francisco, San Jose, Santa Clara, Santa Cruz. Palo Alto, Monterey, Sacramento, Los Angeles, San Diego, Silicon Valley, East Bay. Covering Central Coast, Bay Area cites as well Las Vegas Nevada and the entire West Coast. We have multiple units in stock and ready for your guests to enjoy.